a culture of Acremonium zeae. Acremonium zeae is a type of fungus called an endophyte that lives inside the kernels of corn plants, neither harming nor benefiting its host. Now, Agricultural Research Service (ARS) and University of Iowa (UI) scientists have found that corn plants do indeed benefit from the endophyte's presence—especially as they try to ward off other fungi, like Aspergillus flavus and Fusarium verticillioides. Both are species of toxin-producing molds that can cause multimillion-dollar losses to the U.S. corn crop. 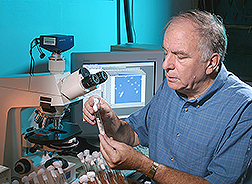 In studies at ARS's National Center for Agricultural Utilization Research in Peoria, Illinois, and UI's Department of Chemistry in Iowa City, collaborating scientists Don Wicklow and Jim Gloer showed, for the first time, that the endophyte secretes an antifungal concoction that may stop the molds from growing inside the seed. "Acremonium zeae is mostly a benign player in corn, but it produces compounds called pyrrocidines that work against the Aspergillus and Fusarium fungi as well as some bacteria," says Wicklow, a microbiologist in the ARS center's Mycotoxin Research Unit. "Pyrrocidines are the first natural products reported from this common fungal endophyte in corn." Lab tests by Wicklow's group showed that the endophyte is antagonistic to the molds and interferes with Aspergillus's ability to infect ripening corn kernels and contaminate them with a carcinogen called aflatoxin. Such antagonism may also protect the corn plant from the F. verticillioides disease, stalk rot. Gloer's lab studied the antifungal activity of extracts from A. zeae lab cultures and identified the source as two recently reported antibiotics, pyrrocidines A and B. In 2002, Wicklow followed up that work by inoculating field plots of corn with the endophyte. He demonstrated that A. zeae can naturally produce the pyrrocidines in corn and that the treatment could slow spread of Aspergillus in the crop's seed. "This was important to nail down," Wicklow says, "because then we would have documentation that the compounds are also produced naturally in corn kernels, where interference with A. flavus or F. verticillioides infection would occur." Initially, they found pyrrocidines as major components in culture extracts of just 2 of 13 A. zeae isolates obtained from the ARS Culture Collection, housed at the Peoria center. But a later switch to liquid chromatography and mass spectrometry detection methods revealed that 12 of the 13 isolates produced the pyrrocidines. The discovery warrants a closer look at A. zeae's importance in corn, Wicklow notes, but the practical implications remain to be seen. "You can't simply pump these pyrrocidines into corn," he notes. "But A. zeae is carried naturally within the seed, growing into the seedling and spreading throughout the plant. We can study the environmental conditions under which it becomes the dominant fungus in corn and look there for clues to controlling Aspergillus and Fusarium. "—By Jan Suszkiw, Agricultural Research Service Information Staff. Donald T. Wicklow is in the USDA-ARS Mycotoxin Research Unit, National Center for Agricultural Utilization Research, 1815 University St., Peoria, IL 61604; phone (309) 681-6243, fax (309) 681-6689. "Corn-Friendly Fungus Tapped for Service" was published in the December 2004 issue of Agricultural Research magazine.